Do you need fresh new ideas for merchandising your cosmetic products? This custom countertop display by Clarins is a great example! 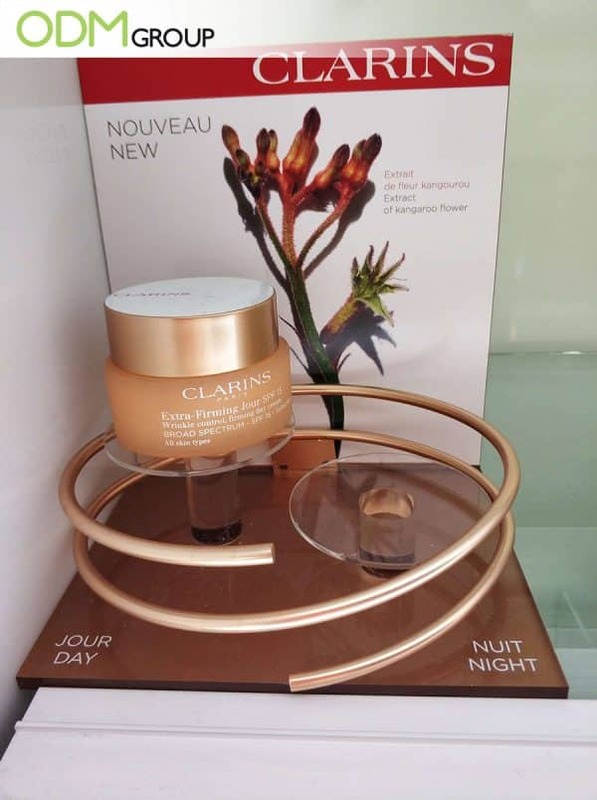 What caught our attention is the spiral accent that surrounds Clarins’ Extra Firming Day and Night Cream. There were two mini platforms inside the spiral. This is where the products are placed. Acrylic and metal are the primary materials for this cosmetic POS display, creating a high-end and glamorous look. The rose gold finish of the metal spiral blends well with the color of the product’s container, thereby creating unity in design. The advert that serves as the backdrop complemented the overall look. “Extract of Kangaroo Flower” was written on the poster, giving customers an idea what this product is made of. Opposite each platform “Day” and “Night” were written so as to guide buyers. 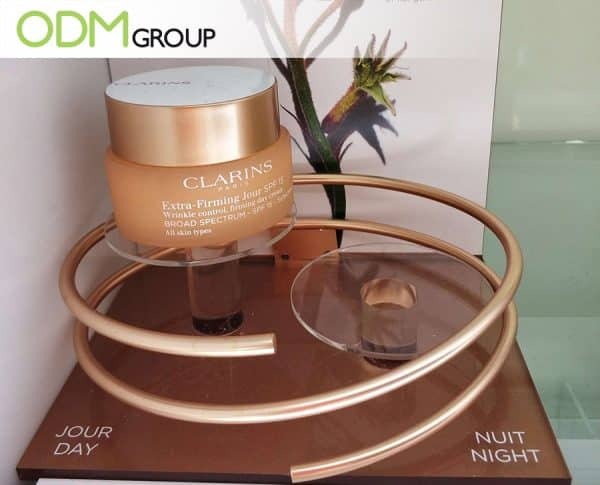 Indeed, Clarins did great in promoting their line of products through their counter POS display. The choice of materials and colors allowed Clarins to project quality and class. The way the products were presented emphasized the qualities that make the products great. Your presentation is as important as the product itself, so we would love to share some tips to help you succeed in your POS advertising. So to achieve great results, it is necessary to carefully plan your design. As business owners, you want to make sure that your cosmetic product display generates brand conversion. But how? Here are the factors to consider when creating a knockout custom countertop displays. Marketing Budget: This is one of the most important aspects to consider as the more complex the design is, the larger the needed budget would be. Your counter display can be as elaborate or as simple as your budget allows. In addition to the complexity of the design, you should also consider the labor cost; installation, and the maintenance cost of custom POS displays. Ease of Assembly: Ergonomics should be considered when designing your countertop display. Make sure that your display is easy to assemble. Nobody wants to waste time setting up their POS displays. Capacity of the POS Display Unit: The capacity of the POS display, should always be considered. What kind of product, its volume, and how many of them will be stocked, will help determine what material, style, and marketing budget you’ll need. Interactivity: Designers should also consider how customers will use the POS display. With interactive pos displays becoming the trend nowadays, you should think about how the customers will interact with your products. Some merchandisers like to use testers and free gift items so additional parts to store your testers and gifts may be needed. Here’s a great example of an effective interactive POS display by The Belvanie. Customers can touch the sample bottles and read the labels and their firsthand experience can help them make wise buying decisions. Customizability: Flexibility is also one of the main considerations when manufacturing your POS / POP. For instance, some custom display stands have slots to allow merchandisers to change the promotional poster. This is cost-effective as merchandisers need not source new custom pop displays every time. If you’re ready to create a knockout custom countertop display, then contact The ODM Group today. Our merchandisers and product designers will assist you in every step of the way from design, sourcing, and manufacturing. With years in the promotional products industry, you can count on usto deliver high quality branded promotional products for your business. If you’re looking for more marketing and design ideas, check out these blogs! This unique POP display is definitely getting a lot of attention. The Doraemon plushie attracts people to learn more about their purchase with purchase promotions.